2018 US reprinte on 180g LP- Recorded Onstage in 1980: Nylon-String Guitars, Pointillistic Details, Flamenco Melodies Come to Supreme Life on This Audiophile Pressing. 2018 Eu reissue on 180g LP Recorded Onstage in 1980: Nylon-String Guitars, Pointillistic Details, Flamenco Melodies Come to Supreme Life on This Audiophile Pressing. 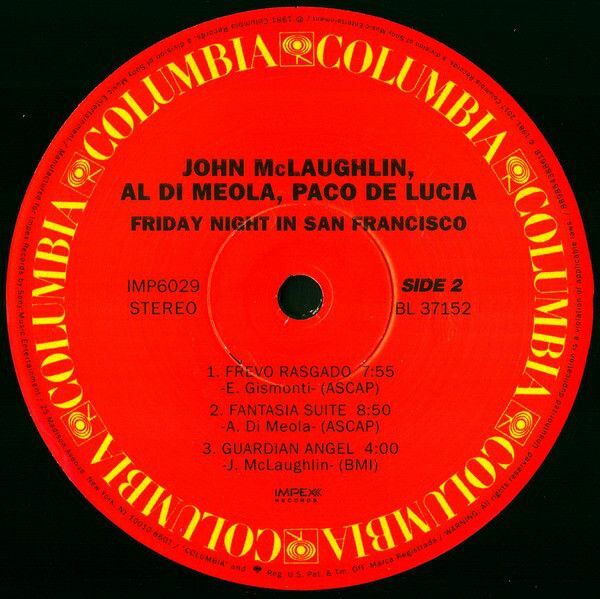 Jazzheads, guitar freaks, and audiophiles listen up: Here's the iconic 1981 album that virtuoso guitarists Al Di Meola, John McLaughlin, and Paco De Lucia recorded at The Warfield Theatre on December 5, 1980, in San Francisco. 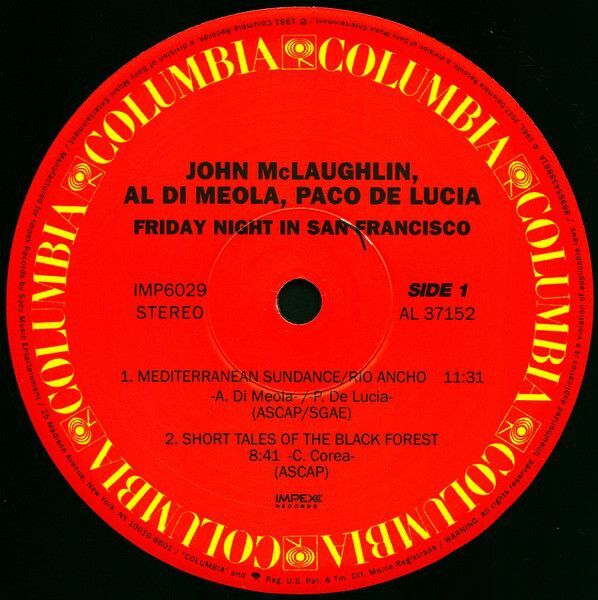 All tracks are live except for the closer, "Guardian Angel," the opening theme from a song that appears on McLaughlin's 1978 album Electric Dreams. 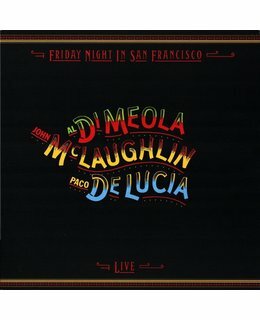 Friday Night In San Francisco is by far one of the most acclaimed guitar albums ever made. 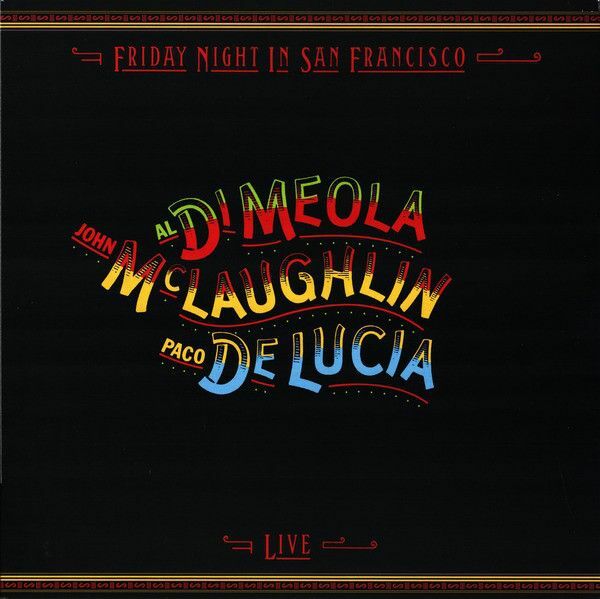 DiMeola, McLaughlin, and De Lucia play nylon-stringed classical guitars to absolute perfection in a flamenco/jazz style. From start to finish, the set is as extraordinary as it is influential in the evolution of the acoustic guitar. And now, it sounds positively smashing. Impex Records is the exciting audiophile label from the team that brought you Cisco Music. 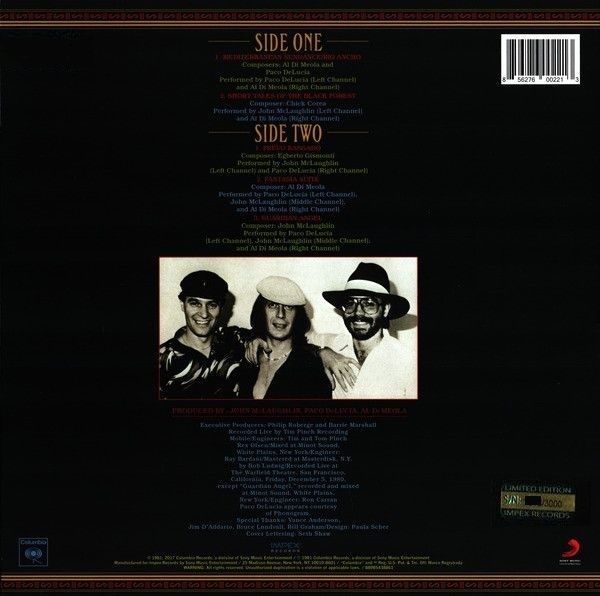 With more than 20 years experience and 150 titles released, Cisco Music developed many of the techniques used by other labels to make the highest quality 180-gram LPs, SACDs and Gold and aluminum CDs. We brought definitive editions Jennifer Warnes' The Well, The Hunter and Famous Blue Raincoat in multiple formats, including a 45 rpm box set that Absolute Sound magazine declared "defines the state-of-the--art in vinyl playback." Other classic reissues we nurtured to fantastic rebirths include the jazz-rock perfection of Steely Dan's Aja, Joan Baez' Farewell Angelina, Nathan Milstein's poetic interpretation of Dvorak's Violin Concerto and four exquisite 45-rpm Three Blind Mice LPs. Evidence of our unwavering recognition of quality, we were entrusted with the distribution and production of The Super Analogue Disc, the original audiophile 180-gram LPs. King Records recognized, from the very beginning, that Cisco Music brought unflinching passion to the music and unflailing dedication to the process of bringing that music to the most discerning listeners in the world. Now as Impex Records some of the original Cisco staff (Abey Fonn, Robert Pincus and Robert Sliger), along with Robert Donnelly, will follow and expand our own high standards for a new generation of audiophile products. Analog products will always be cut using analog tapes and analog mastering at the finest mastering facilities like Sterling, Cohearent and Bernie Grundman–just as it should be. Gold CD's will always be cut with high-definition digital or analog tape transfers from original sources.